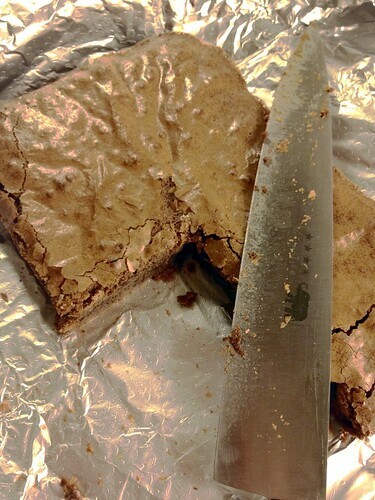 Deb of Smitten Kitchen calls these her favorite brownies. I call them husband-proof. They're the sort of brownies your non-baking husband can make for you when the baby is whiny and won't go to sleep, while your hyper toddler eats apple after apple, because he refused dinner, and when you haven't had a moment to yourself all day. These are the brownies my husband made. And he'll make them again, because they were so simple and easy to make that they boosted his confidence. They're made in one (microwave-proof) bowl and one lined pan, so even clean-up is minimal. Yes, they contain a lot of sugar. That's what makes them so good. Melt chocolate and butter together in a bowl, in the microwave. Start at 45 seconds, stir well and then try another 30 seconds. Stir until smooth. Stir in the sugar, eggs, salt and vanilla. Finally fold in the flour and bake at 175°C for 25-30 minutes. A cake tester should come out mostly clean. Mine were perfect after 27 minutes. Let them cool, or not - that's up to you. I'm surprised that microwaving chocolate didn't destroy it! Its always terrible when you burn chocolate. So easy to make and delicious. Made a batch yesterday and will be making another batch tomorrow as they've gone already! Wow! That's far too much sugar for those proportions (in my opinion). For 2 eggs, I use between 180-190g of sugar and it's enough. I find that this also means the chocolate flavour comes out even more. They surely look good, though.